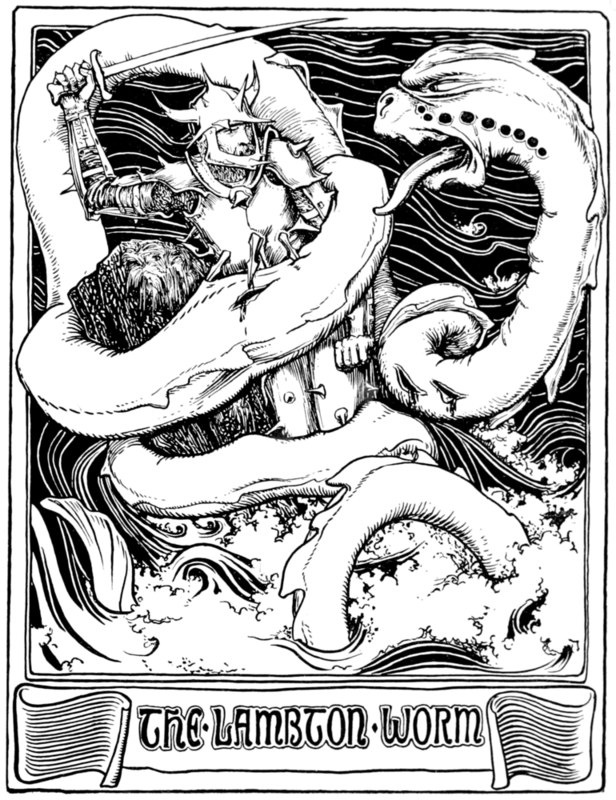 The Lambton Worm is a legend from the Southern part of the North East of England in the UK. 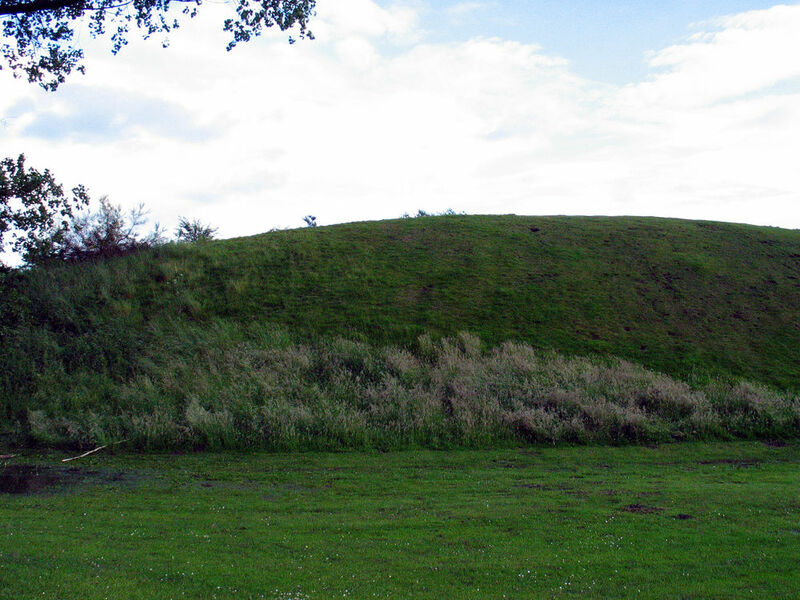 The story is one of the area's most famous pieces of folklore, having been adapted from written and oral tradition into pantomime and song formats. 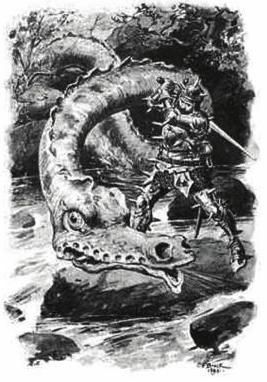 The story revolves around John Lambton, a heir of the Lambton Estate, County Durham, and his battle with a giant worm (dragon) which had been terrorising the local villages. As with most myths, details of the story change with each telling. The story states that the young John Lambton was a rebellious character who missed church one Sunday to go fishing in the River Wear. In many versions of the story, while walking to the river, or setting up his equipment, John receives warnings from an old man that no good can come from missing church. John Lambton does not catch anything until the time the church service finishes, at which point he fishes out a small eel- or lamprey-like creature with nine holes on each side of its salamander-like head. Depending on the version of the story the worm is no bigger than a thumb, or about 3 feet long. In some renditions it has legs, while in others it is said to more closely resemble a snake. At this point the old man returns, although in some versions it is a different character. John declares that he has caught the devil and decides to dispose of his catch by discarding it down a nearby well. The old man then issues further warnings about the nature of the beast. John then forgets about the creature and eventually grows up. As a penance for his rebellious early years he joins the crusades. Eventually the worm grows extremely large and the well becomes poisonous. The villagers start to notice livestock going missing and discover that the fully-grown worm has emerged from the well and coiled itself around a local hill. 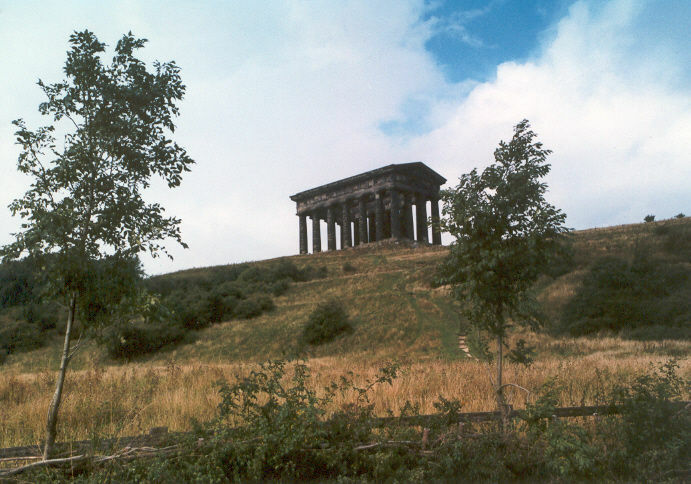 In some versions of the story the hill is Penshaw Hill, that on which the Penshaw Monument now stands, but locally the credit goes to the nearby Worm Hill, in Fatfield. In most versions of the story the worm is large enough to wrap itself around Penshaw Hill 7 times. It is said that one can still see the marks of the worm on Worm Hill. The worm terrorises the nearby villages, eating sheep, preventing cows from producing milk and snatching away small children. It then heads towards Lambton Castle where the Lord (John Lambton's aged father) manages to sedate the creature in what becomes a daily ritual of offering the worm milk of nine good cows, twenty gallons, or a filled wooden/stone trough. A number of brave villagers try to kill the beast but are quickly dispatched. When a chunk is cut off the worm it simply reattaches the missing piece. Visiting knights also try to assault the beast but none survive. When annoyed the worm would uproot trees by coiling its tail around them. It then created devastation by waving around the uprooted trees like a club. After seven years John Lambton returns from the crusade to find his father's estates almost destitute because of the worm. John decides to fight it but first seeks the guidance of a wise woman or witch near Durham. The witch hardens John's resolve to kill the beast by explaining his responsibility for the worm. She tells him to cover his armour in spearheads and fight the worm in the River Wear, where it now spends its days wrapped around a great rock. The witch also tells John that after killing the worm he must then kill the first living thing he sees, or else his family will be cursed for nine generations and will not die in their beds. John prepares his armour according to the witch's instructions and arranges with his father that when he has killed the worm he will sound his hunting horn three times. On this signal his father is to release his favourite hound so that it will run to John, who can then kill the dog and thus avoid the curse. John Lambton then fights the worm by the river. The worm tries to crush him, wrapping him in its coils, but it cuts itself on his armour's spikes. As pieces of the worm are chopped off they are washed away by the river, preventing the worm from healing itself. Eventually the worm is dead and John sounds his hunting horn three times. Unfortunately, John's father is so excited that the beast is dead that he forgets to release the hound and rushes out to congratulate his son. John cannot bear to kill his father and so, after they meet, the hound is released and dutifully dispatched. But it is too late and nine generations of Lambtons are cursed so they shall not die peacefully in their beds. 9th: Henry Lambton, died in his carriage crossing Lambton Bridge on June 26, 1761. The story was made into a song, written in 1867 by C.M. Leumane (it has now passed into oral tradition and has several slightly different variants). The dialect is most effective when sung in a regional Mackem accent. The queer worm i' tha well.